Got a door that needs opening? a position vacant for a doorman? Morepork / Owl Butlers will politely hold the door open for you everytime. Delight your visitors and be welcomed into the room by these cute little owls. 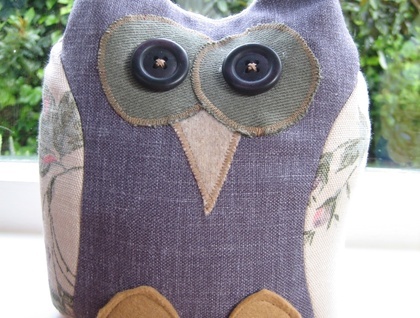 Moreporks are made from the finest Laura Ashley fabric book pages and filled with clean dry sand. They seek employment in fun-loving homes. They are compatible with other pets and require no special treatments, remuneration or food.Quiet in nature they make no sounds audible by humans, making them ideal house pets. Adopt one today, Available in different colours.